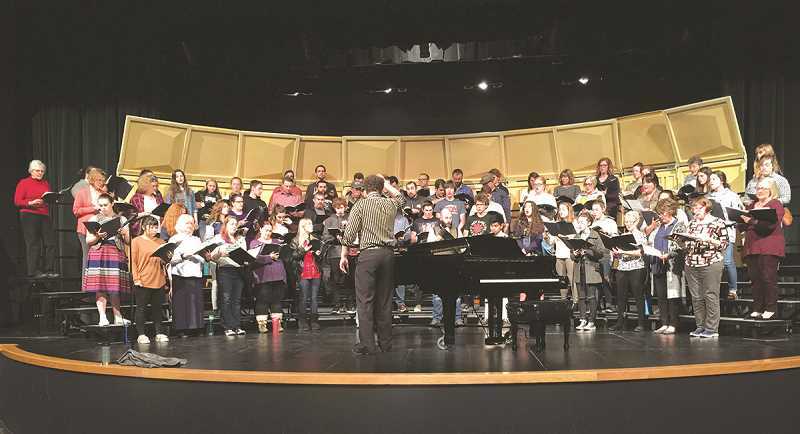 On Friday and Saturday, April 27-28, the Canby Alumni Choir will take part in a fundraising event at 7 p.m. at the Richard R. Brown Fine Arts Center. The concert will also feature the Canby High School Concert Choir that has earned a berth at the Oregon 6A State Choir Competition on May 5. The idea for an alumni choir originated with Tom Gingerich, who taught choir at Canby High from 1977 until 2007. He has helped organize the group, helped select the music, and will be directing about half of the performed pieces. The other half of the directing team is Brooks Gingerich, who has been the choir director at Canby since 2008. And yes, he is Tom's nephew. Brooks and Tom spend many hours listening to music to select a variety and preparing music for the 90 adults and current concert choir members that meet each week. Tickets are available at the Cutsforth's Thriftway customer service desk, or at the door on Friday and Saturday. Adult tickets are $10, and students grades K-12 are $5. All funds raised will be used at Canby High to provide support for the choral music program. The past two years, the funds raised have helped to purchase new four-step risers with safety rails and eight electric pianos that never need tuning and can be moved around the building easily and safely for sectional rehearsals. Future projects may include replacement of the 40-year-old fiberglass choir shells used on stage to back the choirs and bring the sound out into the auditorium, as well as needed sound system upgrades. This year the concert will be dedicated to Robert P. Lantz. Lantz taught music and choir in the Canby School district from 1966 until 1971, and passed away in Indianapolis in December 2016.